Kevin has been in professional baseball for over 35 years. He previously worked in the AAA International League with the Rochester Red Wings (Baltimore Orioles) from 1984 - 1991, and Tidewater Tides (New York Mets) in 1992. Kevin hails from Waddington NY. His Peers have voted him Pioneer League Executive of the Year four times 1995, 1998, 2001, and 2013. When away from the park, Kevin enjoys golfing and skiing. Paul Henderson has been with the Chukars for over 10 years. Paul graduated from Idaho State University and has since been working for the Chukars. In his downtime Paul enjoys hanging out with friends and family, and Dallas Cowboy Football. Josh is has been with the Chukars since 2017 and serves as our Assistant General Manager He graduated from Grand Canyon University in Phoenix Arizona, as the very first graduate of the Sports Business Management Program. He hails from Rockford, Illinois, and when he is not rooting for the Chicago Cubs. Josh is working with the Nikolas Ritschel Foundation which helps raise money to find the cure for cancer. Aaron first started with the Chukars back in 2016 as an Intern. After a season abroad in Missoula Montana with a league rival. He has come back to the greener side, Serving as the Director Of Operations. He is a Communications graduate from Brigham Young University. Aaron hails from Concord Calfornia which is nestled right the Bay Area. When he is not working He enjoys Working out, Rooting for the Oakland A's and other Bay Area sports teams, and frequently visiting his barber for fresh haircuts. Reach out to Aaron for any questions about Sponsorships on any level, Tickets, Company Outings. Promotions, or Community Outreach. Chris Hall makes his full time debut in the 2019 season. Chris enjoys sports. His dogs, and winning at life. Chris can be reached for Promotions, Media Request. or Community Outreach. The Voice of Idaho Falls. 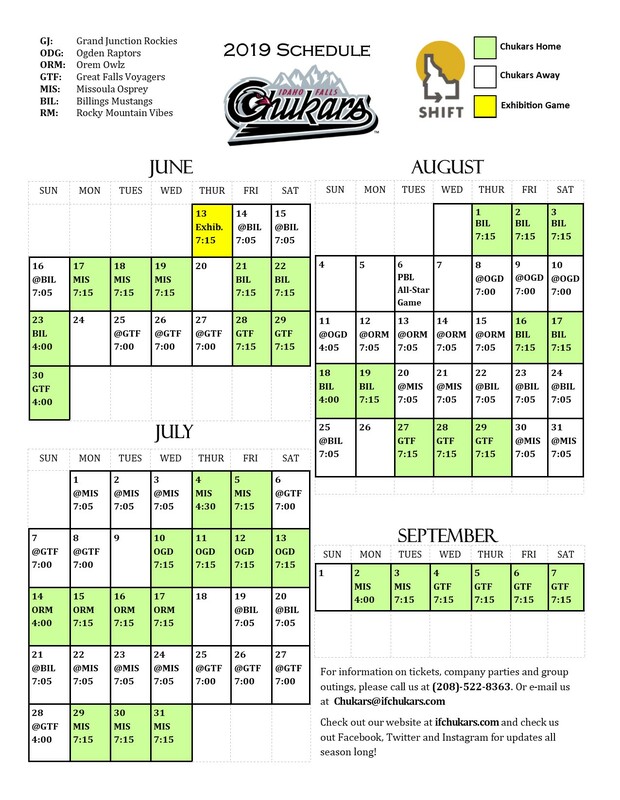 All 76 Idaho Falls Chukars games can be heard on ESPN The Sports Zone 94.5 & 105.1 FM, and 980 AM at ifchukars.com, via the First Pitch app, and on the TuneIn Radio app.